On the occasion of the graduation ceremony of the Military Academy’s 134th class , now in front of the National Assembly in Belgrade organized a celebration. Youngest officers of our army , 162 of them paraded in front of the President of the Republic Tomislav Nikolic , First Deputy Prime Minister Aleksandar Vucic , Defence Minister Nebojsa Rodic, the Serbian Army Chief of Staff Gen. Dikovic , the highest state leadership doplomatskog corps, military and diplomatic representatives, delegations from a number of the world's military academies paraded the This is the eighth time that the formal promotion of new officers going in front of the National Assembly . The President of the Republic of Serbia , Tomislav Nikolic , according to tradition , handed officers’ swords to the top three officers in the rank- Lieutenants Jovan SIBINOVIC , Sinisa CABARKAPA and Dimitrije BECAREVIC . Defense Minister Nebojsa Rodic awarded two top lieutenants from the Army and Air Force study programs pistols with the inscription – to Nemanja Smajovic and Ivan Mudri . 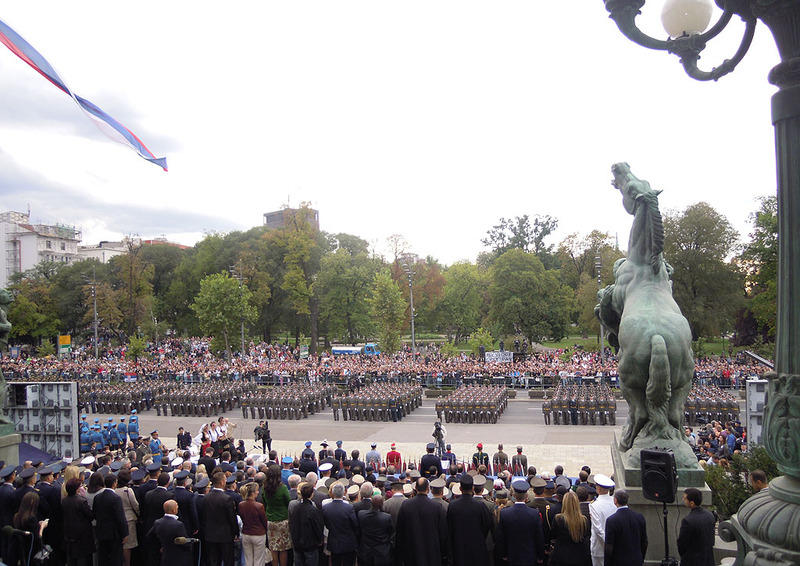 Addressing the parade, the President of the Republic of Serbia, Tomislav Nikolic expressed pride that on behalf of all citizens of Serbia the youngest generation of Serbian Army officers stands before you. 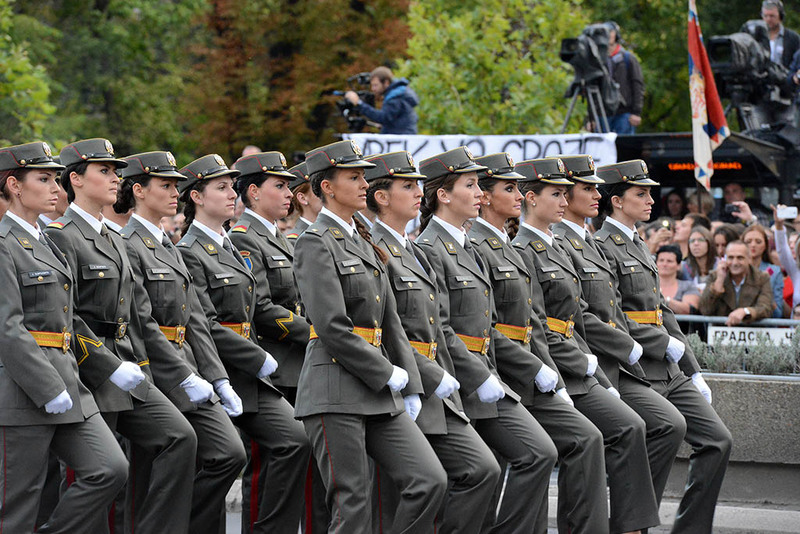 - Four years ago , when you were admitted to the Military Academy , the civilian and military leadership of the country accepted the responsibility turn very carefully selected and talented girls and boys into honorable men and women , to prepare them for the challenges that come with an officer's calling. Your individual ambitions should be part of what has always graced Serbian officers: freedom and determination to better serve his country . The task was completed successfully and now you are standing before us. Only one more day we are responsible for you, but as of tomorrow you will be the ones who will be looking after us. The education you have received has enabled you to command and to execute all tasks placed before you - president said Nikolic. - You will be performing your initial duties at the times of turbulent changes which are occurring globally. The shift of political and economic power in the world is inevitable, which in turn will cause geo strategic turbulences and therefore serious transformations of power in the military domain. Therefore, it is only natural that the traditional tasks are changing due to these shifts and new responsibilities are placed before you. Although the primary objective of any military is defense against possible aggression, their participation in peaceful resolution of crises worldwide is becoming more frequent and more important. These trends and the development of new technologies oblige us to constantly review the organization and transformation of the armed forces - said the president of Serbia . Nikolic stressed that in today's world, the Republic of Serbia pave your way to prosperity and taking a well-deserved place in the European family of nations. - On our way to EU we need to preserve and promote the values that make our country different from all others . The tasks in the process of accession to the European Union will become more numerous and more serious. However, if we want to achieve these important foreign policy goals as soon as possible, it will have to activate and strengthen its intellectual , political, economic , financial and other resources - underlined the president of the Republic. According to Nikolic, one of the conditions for achieving these goals is the resistance and strengthening of the security and defense system. Only in terms of internal stability as president Nikolic remarked , both state and society can develop harmoniously - in the political, economic, social, cultural and every other way. - Army of Serbia and its members in all of this are important . State leadership is dedicated to the Army , in the political , material and financial terms , to provide what she needed most at this time . This attitude towards the military , on the one hand, reflects our awareness of the importance of its mission , and on the other hand, we are dedicated to those people looking after our safety. However, we are will aware that our resources are scarce, yet we strive to find the most effective way to maintain existing military and create new military capabilities, to equip the modern systems in order to strengthen the overall defense potential of the country . In addition , the Army of Serbia must be prepared , if necessary, to support our civil authorities. At the same time , the SAF work to promote peace in the region and the world, strengthening good neighborly relations and cooperation with countries on all continents. Because for several years the military leadership has been successfully preparing units and individuals who represent our country in international operations - said the President of the Republic. Nikolic told the youngest officers that each end means afresh start, so their graduation opens p doors to this fresh new start. - Make sure you perfect constantly as persons and officers. Build your career with honor, courage , bravery and devotion to the motherland , which has given military heroes throughout our history. Follow in their footsteps in performing the tasks placed before you by the state and society - said the Chief of the Serbian Army 's youngest officers Serbian President commented on the upcoming anniversary, the centenary of the First World War and recent voices that its role be reevaluated. - Let me remind you that in the next the entire world will be dedicated to the celebration of the centenary of the great tragedy that befell many European nations, especially Serbian people. Some will try to take advantage of the great jubilee and make so called revisions of the events that led to WWI, if you will , and to alter historical facts at free will. Movies are being made , rallies organized, lies are being fabricated about the role of small and honorable Serbia in World War I. It was not enough that Serbia had lost youth fending off powerful countries that attacked Serbia from all sides of the world. It seems that that fact alone either is not enough or they are not happy that the victory of Serbia inspired its allies to resolve the question of whether the world after the war will be a better or a worse place . Furthermore he stressed that young officers today are beginning a new chapter of life and aware that the long awaited this day . - You and your parents have every reason to be proud. We know that the past four years have not been easy. I also believe that you are aware that upon receiving your rank the character of your responsibility changes substantially. As of today, you will not think about the results and their own personal development , but, above all , contributing to the progress of the unit or establishments you are assigned to. Those who will be commanding over non-commissioned officers and soldiers will have a particularly complex task You career and return to the Military Academy for further training will depend on how well you perform your duties. I congratulate you on the initial assignments wishing you good health and success in life. Long live Serbia ! – as President Tomislav Nikolic concluded. Head of the Military Academy , Major General Mladen Vuruna , addressing the audience said he was pleased and honored to have been attended this solemn event . He pointed out that the presence of many delegations only proves what kind of reputation it has.. General Vuruna particularly welcomed the commander of the Ohio National Guard Major General Deborah Ešenhurst the cadets and officers of the military academies of France, Germany , the Czech Republic , Slovakia and Algeria. - Today the Military Academy is a university institution , a member of the University of Defence , with 163 years of experience and success in the education of officers for the defense of the country. Our success is based on the illustrious history of our ancestors and traditions of the Serbian Liberation Army , and military development of scientific thought and the application of modern methods of teaching . He pointed out that 134 cadets class of the Military Academy had a high GPA after 150 days of training in training grounds, a number of appearances on various sports competitions , 10 research papers have been published as well as a number of humanitarian and public activities where they proudly represented the army and the country they come from. - It will have been nearly a century since the great Serbian and Allied victory of World War I operations . The creators of these operations, and the final victory finished their education at our Military Academy, and most of them were professors of the Academy. Today we have youngest Serbian Army officers before us, proud of Serbia, its Army and the Military Academy where they gained knowledge and skills on how to use this knowledge . This is what adorns the alignment of soldiers, lieutenant whose possess honor, who know their duties and responsibilities and to the duties and obligations and to perform . This kind of dedication and commitment to such life showed that they deserve the rank of lieutenant so it is with deep respect that I salute them and congratulate them.. Lieutenant Ivan Sibinovic handed down the academy’s flag of the Cadet Brigade to cadet Milica Masic, who is currently the most successful cadet of the next 135th class of the Military Academy. It is a symbolic handover of the Cadet between the best outgoing cadet to the best cadet who will be produced in the officer ranks next year. During the ceremonial parade of the Military Academy , in front of the National Assembly the planes and helicopters of Air Force Army of Serbia flew over while pilot Major Dejan Beda from " MIG " 29 congratulated the lieutenants their first officer's ranks. Guard members performed the exhibition drill, the ceremony featuring the performance of International Orchestra Guard and artistic ensemble "Stanislav Binicki ." Defense Minister Nebojsa Rodic said there is a lot of symbolism in today's day because of two factors - the youngest Serbian Army officers completed the four-year school, while today we mark 95 years since the great battle of breakthrough of the Thessalonica front. - It is an inspiration for all the young cadets to be worthy of the name and work of those whose heroism celebrate . We all sincerely wish them good health and much success to always have their own idea, to know that there is no unobtainable goal and that they will achieve it only through hard work. Assembly President Nebojsa Stefanovic said that it is always an honor for a country when promoting a new class of officers . - It could best be seen on the faces showed what this means for the country – we could see honor , dignity and pride of parents , young girls and boys who are now stepping into new military life , but also the obligation to defend the country, preserving its dignity and acquiring new knowledge and skills that will make them just the right officer, said Stefanovic . Serbian Army Chief General Ljubisa Dikovic said he was proud of today's ceremony , a time that is before us confirm that these young officers will be the pride of our homeland . Nenead Mihajlovic from Cuprija , came to see his son Marko. -You have to love your profession, it was not difficult for him because he always wanted to be an officer. This wish came true today! Gordana Mutavddiz could hardly wait for this day to com , she came to cheer for her daughter Marija, who shocked them 4 years ago by announcing her wish to enroll the academy. -It seems like it was yesterday! I was surprised , but I supported her. Now I am very happy for her. - Two years ago, I worked and spent time with the cadets so I take this opportunity to congratulate them . I understand they have stage fright , as I have stage fright too since tomorrow we will be finishing the series.